How to Make a Great Wedding Website! Wedding websites are now becoming more popular than ever – and for good reason! Creating a wedding website (also known as a wedsite) is one of the most effective and convenient ways to communicate with guests and prepare them for your special day. Not only do wedsites streamline guest communication, but they also help to set expectations for the big event and ensure all of your guests are on the same page. It’s easy to see why they have fast become the ultimate wedding planning tool for modern couples! However, not all wedding websites are created equal. It’s important to ensure that your wedding website is not only a practical resource, but also conveys the right tone for your upcoming celebrations. Wedding websites are what we do best, and luckily we have some tried and tested tips to help you create a great wedding website without any headaches. From site navigation to creative personalisation, keep reading for our words of wisdom when it comes to making your wedding website truly memorable! What’s the Point of Having a Wedding Website? First things first – what exactly is the point of having a wedding website? Is it really a necessary part of the planning process? In our opinion, a wedding website is an absolute must-have planning tool, for a few key reasons. The main benefit of creating a wedding website is to ensure all of your guests are prepared for your upcoming nuptials. A wedding website helps you communicate all of those essential details that you don’t necessarily have room for on your wedding invitations. This is particularly important to help prepare guests who might be travelling interstate to attend your event, or for couples planning a destination wedding. Instead of communicating with guests individually and answering the same old questions, a wedding website acts as a central hub of information and resources for your guests to refer to. Along with the practical side of things, a wedding website also helps you to build excitement for the big day. It’s the perfect opportunity to provide some background information on your relationship and the key members involved in your upcoming celebrations. By creating a RSVP wedding website on WEDSITES, you can take advantage of the automated RSVP reminder and guest list management features which will follow-up with friends and family who may have missed or forgotten about your RSVP deadline. Talk about a time-saving tool! So now that you’ve heard about the benefits of a wedding website, what do you need to know in order to create a good one? A great wedding website should help your guests prepare for the big day. So it’s important to ensure you cover all of the right details! It goes without saying that your wedding website should include the obvious: Who, What, Where and When. Be sure to outline the date, venue location, and timing of events for the day. You’ll then want to think about any additional details that will assist with your guest’s pre-wedding preparations. For example: do they need to arrange transport, or has a coach been organised? Is it a black tie event, or will more relaxed attire be suitable? Will there be a cash bar? Try to pre-empt the most likely questions your guests will have in the lead up to your day, and use your wedding website to provide these answers upfront. Avoid being vague with these details, too. A great wedding website should leave your guests with no confusion! If you’re feeling stuck, we talk about what to include on your wedding website in-depth on the blog. Clear communication should be your number one priority in order to create a useful and practical resource for your guests! A great wedding website should also be user-friendly and easy for your guests to navigate. Remember, you’re trying to simplify the process here – the last thing you want is phone calls from guests trying to make their way around your site! Make sure your wedding website has a clear navigation bar and is optimised for mobile viewing. Your fonts should be easy to read and an appropriate size, while the overall design of your site should have a distinctive flow between pages. If your wedding website also gives your guests the option to RSVP online, make sure this feature is easy to find! This will speed up the RSVP process by encouraging guests to respond in a timely manner. Our top tip here is to take advantage of a wedding website platform that provides templates ready for you to customise. For example, our range of stationery suites are professionally designed, mobile optimised and extremely user-friendly. Once you’ve set up your wedding website, it can also be a great idea to get a second opinion from a friend. Ask them to test your wedding website and get their feedback on clarity, navigation and ease of use. After all, your guests will be the ones using your site the most! Another key feature of a great wedding website is its ability to set the right tone for your event! Whether you’re planning a fairytale garden party or an industrial warehouse celebration, your wedding website is your guests first glimpse into your upcoming nuptials. Clearly defining your wedding vision before designing your wedding website will ensure it aligns with your plans for the big day! 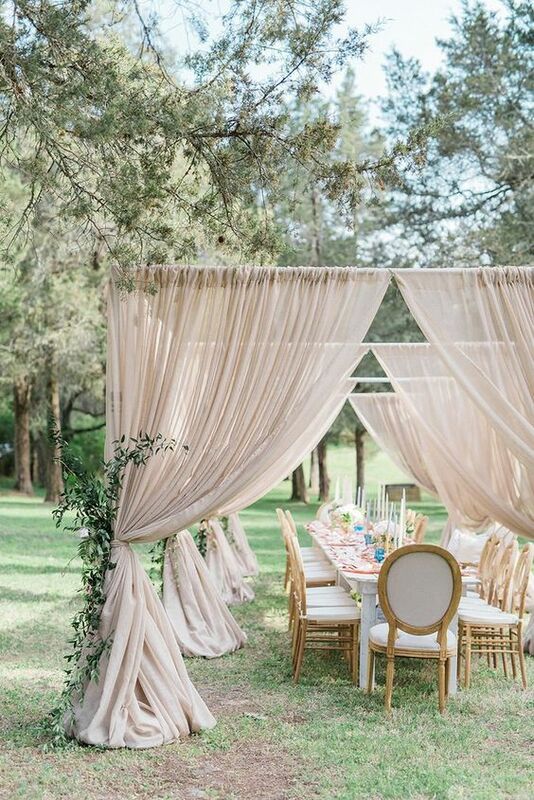 The best wedding websites are the ones that give your guests an idea of what’s to come. This will not only assist them in preparing for the day, but will also help your overall wedding vision flow from beginning to end. Defining your wedding style first will also streamline the process when it comes to the finer details of your wedding website. You’ll find it much easier to make decisions on design templates, images and even the wording used throughout when you have a clear vision in mind. For example, you might choose a minimal, monochrome design with a modern font to complement your industrial warehouse setting, as opposed to a more delicate, pastel theme for a garden party wedding. You can check out our step-by-step guide to defining your wedding vision as a great resource to get started! A great wedding website should also reflect the unique personalities of you and your partner – this is a celebration of your love, after all! Taking the time to personalise your wedding website will really help to build a connection with your guests and give them a candid look into your relationship. Think of your wedding website as an opportunity to get creative. There are so many unique ways to personalise your wedding website, from throwback photos to custom illustrations and even collaborating with guests. Keep in mind that there will likely be some guests who you might not have a strong connection with, like friends of your partner or distant relatives. Putting your own personal stamp on your wedding website is a great way to provide some insight into who you are and what your relationship is all about! Your wording is an essential part of your wedding website, and a great site will have words that leave an impact. Don’t be afraid to get creative with each section of your wedding website to make it truly memorable! From your “about us” story to your bridal party bio descriptions, the wording you use throughout your wedding website can really set the tone for the celebration to come. Even something as simple as directions to your venue can be taken to the next level with the right wording! Think about the best wedding websites you’ve experienced for the weddings of friends and family – which ones stand out in your memory? It’s probably the ones that made you laugh or smile through the wording that was used. If you’re not a natural wordsmith, we have some great wedding website wording templates and examples on the blog to draw inspiration from! And finally, the very best wedding websites are the ones that truly reflect you and your partner. So get them involved in the process in order to create a site that you can both be proud of! Creating your wedding website can actually be a really fun project for you and your partner to undertake together. By joining forces to create your wedding website, the end result will be a sweet memento you can look back on after the big day has been and gone. From writing your love story to reminiscing about old photos, you’ll find yourselves thinking back to where it all began – and appreciating your upcoming nuptials that much more! Wedding websites have become an essential part of the wedding planning process, but there are a few boxes to tick in order to create a truly great one! So if you’re currently looking to build your own wedding website, just keep the above tips in mind to ensure the end result is both practical and personal. And don’t forget to have fun with it – because once your wedding website is up and running, the countdown has officially begun! 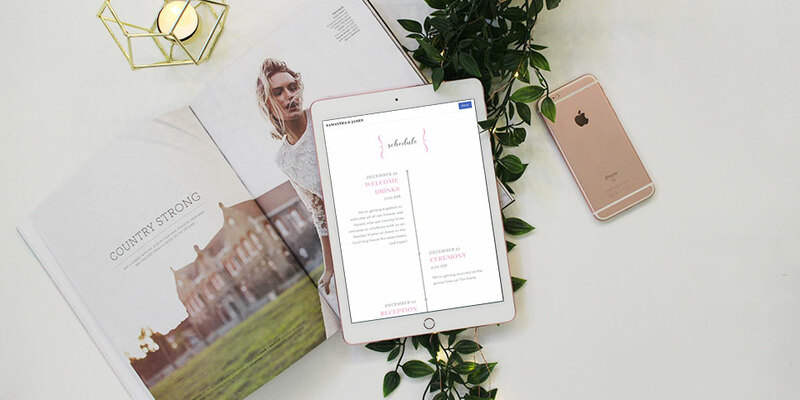 Our platform has everything you need to create the perfect wedding website – from customisable design templates to guest list management and task organisation. Read more about our different features on the blog, or create your account now to get started! 8 Creative Ways to Go Digital with Your Wedding! Get free wedding tips and resources delivered directly to your inbox.